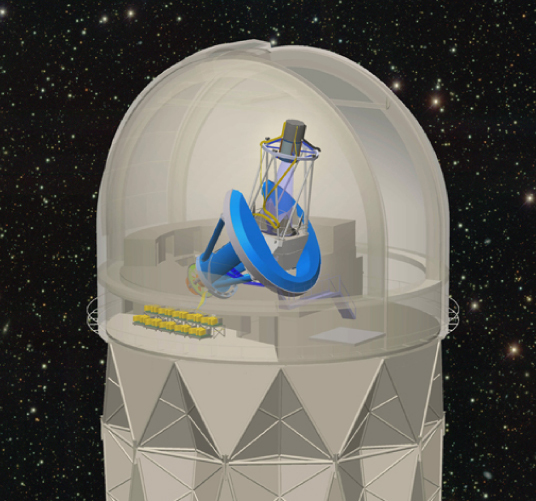 The Dark Energy Spectroscopic Instrument (DESI) will measure the effect of dark energy on the expansion of the universe. It will obtain optical spectra for tens of millions of galaxies and quasars, constructing a 3D map spanning the nearby universe to 11 billion light years. The DESI Survey will be conducted on the Mayall 4-meter telescope at Kitt Peak National Observatory starting in 2019. DESI is supported by the Department of Energy Office of Science to perform this Stage IV dark energy measurement using baryon acoustic oscillations and other techniques that rely on spectroscopic measurements. The completed 6-lens corrector, weighing in at 8,900 pounds, will deliver a huge 8-square degree field-of-view. That’s a sixteen times larger field-of-view than the previous optics. The six hexapods bolted to the skirt will actively position the corrector to microns accuracy.